Bedtime Prayers, Pair - 945 Discounts Apply ! An older pair of figurines. 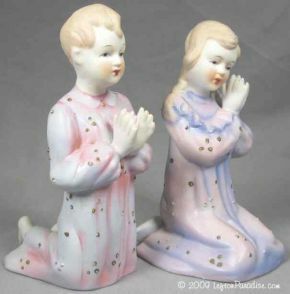 A boy in nightshirt, a girl in nightgown kneeling for bedtime prayers. In flawless condition, very beautiful! They are 5¼ inches tall and marked 945.